Dang, this summer is going fast. I can’t believe it’s been a month since I last posted! 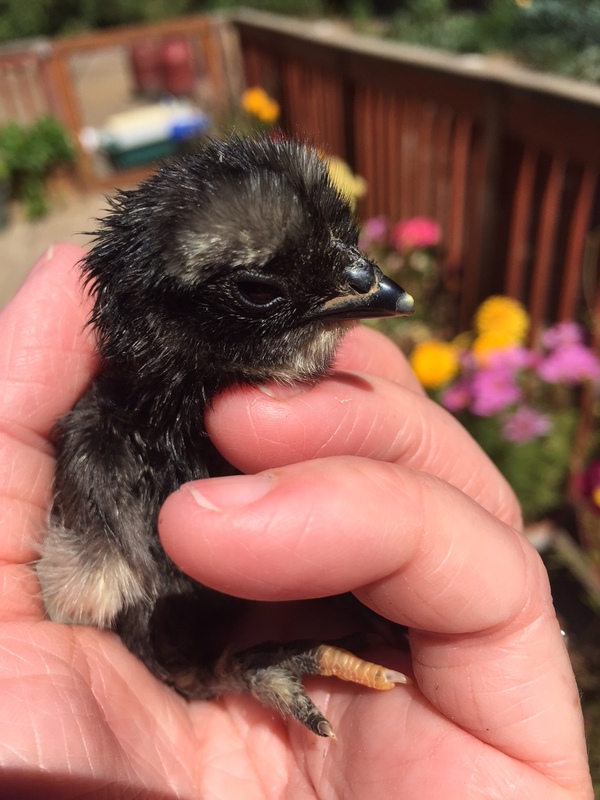 But in my defense, summer is my busy season… Perhaps the most exciting news is we have two new guinea chicks!!! I’ve been letting the broody hens (of which there are many) sit on the guinea eggs, since it makes them happy and most of them don’t ever hatch. I have to admit, it’s incredibly fun to gather them up after a month or so, then hurl them into the woods and listen to them explode. Way more entertaining than firecrackers, although just as lethal if you’re standing nearby when the shell cracks. I’m surprised the smell doesn’t scorch the earth. Every once in awhile though, there’s a fertile egg in the mix. I was sitting in my office one morning when I heard that distinctive plaintive cheeping that can only mean one thing – a cute little fuzzy bird is somewhere out there, and it’s sad and lonely. So naturally I got out there as fast as I could and found a very confused, just hatched guinea chick wandering around in front of the coop. I’m amazed he made it out of the nesting box, but I quickly reunited him with his adopted mama. I moved little Stephano, White Mama (I ran out of creative names the day she hatched), and the rest of the eggs into the garage brooding facility, where little Giuseppe hatched the next day. Just the other day, I head that same frantic chirping, this time coming from the garage. Turns out we had a hen sneaking in there and laying eggs in the corner. And then apparently sitting in there for a month, busily hatching out eggs. Makes me wonder what else is living in there. But anyway, as soon as the rest of the eggs hatch out I’ll be moving that new family into the other half of the brooding box. I really don’t want a bunch of chicks roaming and cavorting all over the garage. It’s bad enough when Woolimina sneaks in there to eat hay and scares the heck out of me when I wander out in the morning to get something out of the freezer. 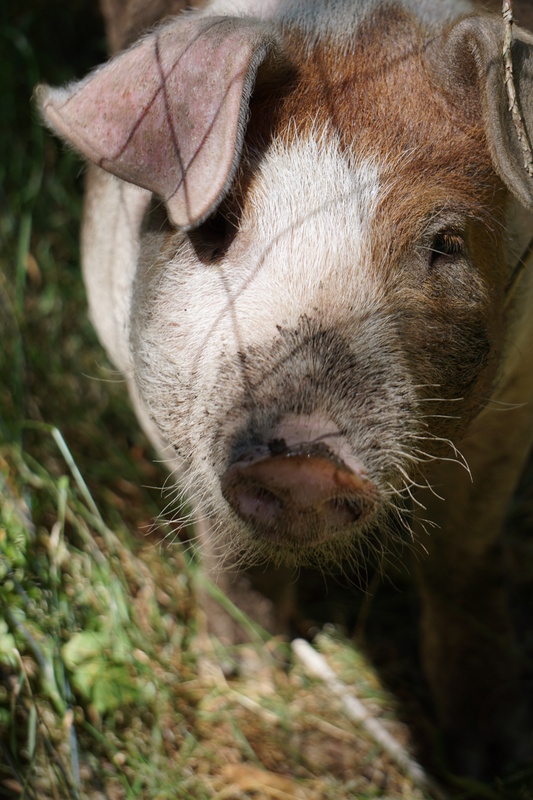 In other news regarding adorable critters, Porkulous the Precious is only getting cuter as he gets bigger. Usually that’s not the case, but he’s a rare pig indeed. Since it’s been in the 90s for as long as I can recall, I put a deeper pool in his fenced off area. It’s got about a foot or so of water in it, and he loves it. He’ll lounge in there all day, and when I fill it up he plays in the stream of water. He also taught himself how to blow bubbles with his snout, which is just about the cutest thing ever. I can’t wait for Gene to see him do it, because I’m sure the heart-warming sight will change his mind about that whole “I’m going to get me some tasty bacon come October” nonsense he keeps going on about.